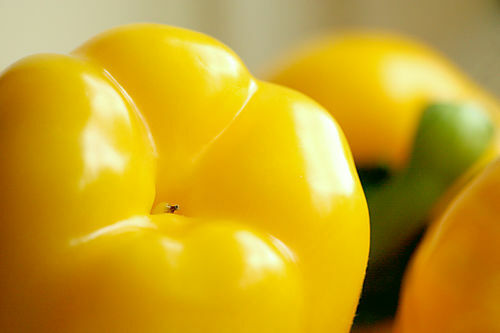 Yellow pepper is a distinct variety of the bell peppers, having diverse colors and aroma. 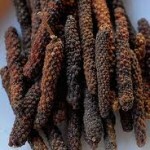 This is botanically a fruit but treated as a spice in various cuisines all over the world. Yellow peppers are rich sources of vitamins and essential nutrients. They are commonly called capsicums and are striking yellow in shade with a glossy exterior. These spices belong to the same family to which eggplants, potatoes and tomatoes belong. They are scientifically known as called capsicum annuum. Taste: They have a sweet taste when they are ripe. 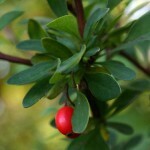 Aroma: Its fruity essence is quite enticing. 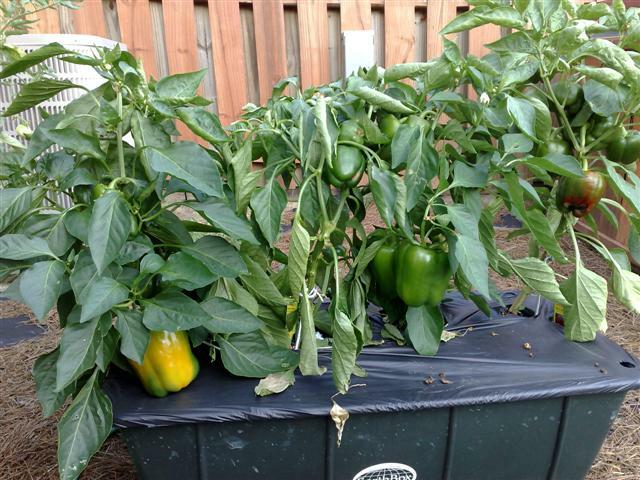 These sweet peppers have originated from Mexico, North and South America in addition with Central America. They, however, got introduced to Europe, Africa and Asia in the late 15th century and are largely grown in these parts of the world now. China ranks first in commercial production of peppers and Mexico follows it in the second position. 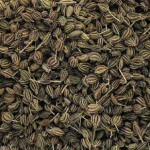 Various US states are also commercial producers of this spice. Since thousands of years these peppers have been used regularly in many cuisines round world. 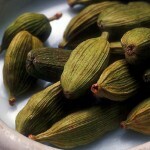 Earliest records suggest the predominance of these spices in Mexico and Central America. It slowly spread elsewhere other than these areas. It was called pimiento in Spanish but was named pepper by Christopher Columbus. Gradually it got introduced to Europe and other continents. 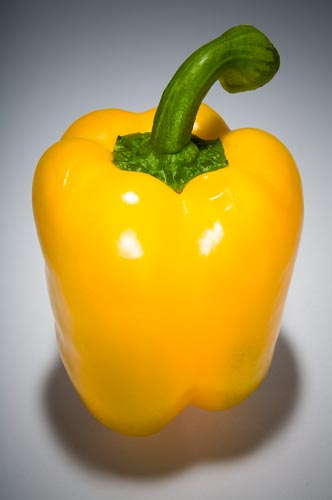 These yellow colored peppers are rich in nutrients from Vitamins to fiber. 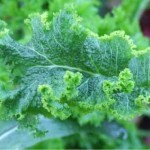 Some of its nutrients are Dietary Fiber, Vitamin A, Vitamin B3- Niacin, Vitamin B5- Pantothenic Acid, Folate, Protein, Copper,- Manganese, Calcium, Iron, Thiamin and Steroidal Alkaloidal Glycoside. 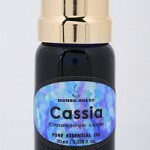 They have a very high concentration of Vitamin C which surpasses even the citrus fruits. 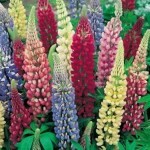 It is widely cultivated all over the world as varied climatic conditions suit their growth. They are better grown in warm climates. Frosts can be fatal to their growth. Climate: It requires full sun for growth. 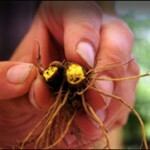 Soil: They grow well in soils that are close to being neutral if not completely neutral. Ph within 7.0 suits them fine though they can also grow in soil having little alkalinity around 7.4 to 7.5. Soil should be supplied with organic matter which in turn enhances production. If it is followed up with mulching, it will help in the retention of moisture in the soil. Germination: The seeds germinate in 3 weeks, approximately. Care: Growing may take long time and in between it should be saved from chills during the nights. At this time it can be transported indoors. Watering: It needs regular supply of water for growing but the soil should be saved from sogginess. Harvest: Pluck the fruits as soon as the fruits become ready to be plucked so that they do not overburden the plant. 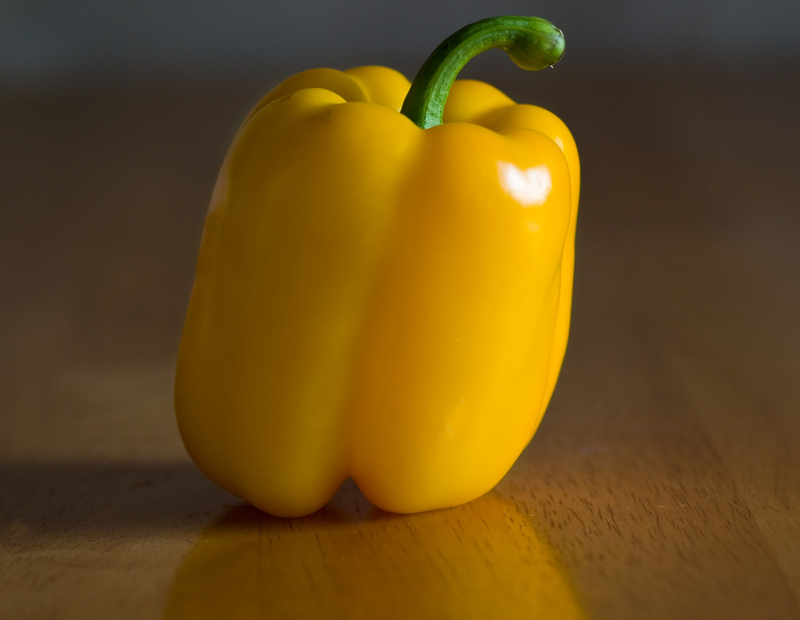 Yellow peppers provide maximum health benefits. Being high on fiber these peppers help in reducing cholesterol. Fibers are also known for their qualities to prevent growth of cancerous cells. Rich in Vitamin C, these peppers heal wound faster and protects cells from getting damaged. They are equipped with beta-carotene and other antioxidants to fight with free radicals that cause life threatening diseases. It keeps teeth and gum healthy. 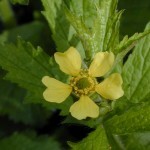 They confer immunity to the body protecting it from various infections and cold. Apart from Vitamin C, it contains Vitamin B6 which safeguards the body against various skin diseases like dermatitis and eczema. Intake of these bell peppers significantly cuts down the risk of arthritis, diabetes and heart ailments among many other fatal health conditions. For maintaining a healthy body these peppers are ideal as they have very less calories. They are good for the skin keeping them young for long. 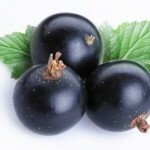 They are a great source of vitamins and minerals which is why they are regularly included in diet. Yellow Peppers can be consumed in a number of ways, either like a spice or like snacks. They endow unique taste and aroma to the food items. These colored peppers are a great stimulant and appetizers which is why they are added to various delectable dishes. They are widely blended into salads as they enhance the quality manifold. 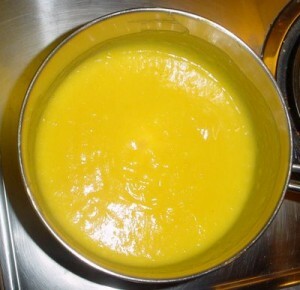 For treating mild coughs, a pudding made of honey and yellow pepper can be taken to reduce the symptoms. 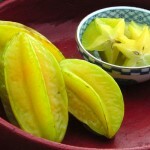 They contain maximum amount of zeaxanthin carotenoids and lutein, which is good for health. 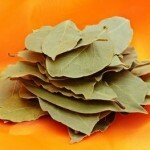 It is an effective remedy for arthritis, rheumatism and pain in the back muscles. It can ease constipation issues by improving digestion since it helps in the secretion of certain digestive juices. 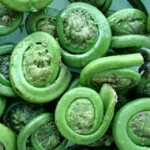 It can be eaten by sautéing seasonal vegetables along with it in low heat. They can be blended into smoothies and fruit juices as well. Soups prepared with yellow peppers are healthy recipes that taste good and help in reducing weight. Tangy salsas can be prepared using these peppers along with other ingredients like rice wine vinegar, garlic cloves, olive oil and honey. These are not seasonal, which is why they can be purchased from any local store, any time of the year. They can also be purchased from online stores at moderate prices. Yellow peppers can be stored after they are washed and their seeds have been removed. After dicing them in small slices they can be refrigerated for 25 to 30 minutes. Next keep them sealed in bags devoid of air to keep them fresh for 5 to 6 months. As the yellow peppers are rich in folate, they are good for pregnant women who require regular dosage of folate. Folate is an important nutrient for nourishing the fetus. 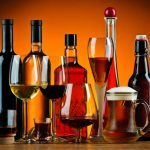 Though there are no such known side effects of these peppers they can cause discomfort if taken in excess and during some ongoing medication. Irrespective of their color, any big fruit shaped like bell are referred to as bell peppers or capsicum in different geographical locations. The term pepper is misleading as these peppers are actually sweeter with very less pungency. Yellow peppers are natural cures for a number of ailments and they also keep the body healthy if taken regularly. Either they are eaten raw in salads or they are cooked in the form of vegetables. 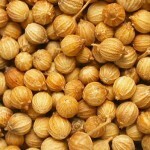 As spices they impart a unique flavor and taste to the food. Some pictures of these plump yellow peppers are listed here.